Strong, quick and energetic, Marshawn Lynch is just a perfect match for his position as a football running back. Playing for the Oakland Raiders of the NFL, Lynch is truly a “Beast Mode” when you dare come in contact with him in the field. Time and time again, he has proven that he’s a reliable member of the offensive back. His excellent size and speed put him in the best position to deliver any time and in any game. Although he may appear to be getting older in the game, his experience and skills still remain exceptional. Marshawn Lynch’s performance has garnered him several recognitions and awards, including making the PrepStar and SuperPrep All-American teams, and emerging as the San Francisco East Bay Player of the Year. 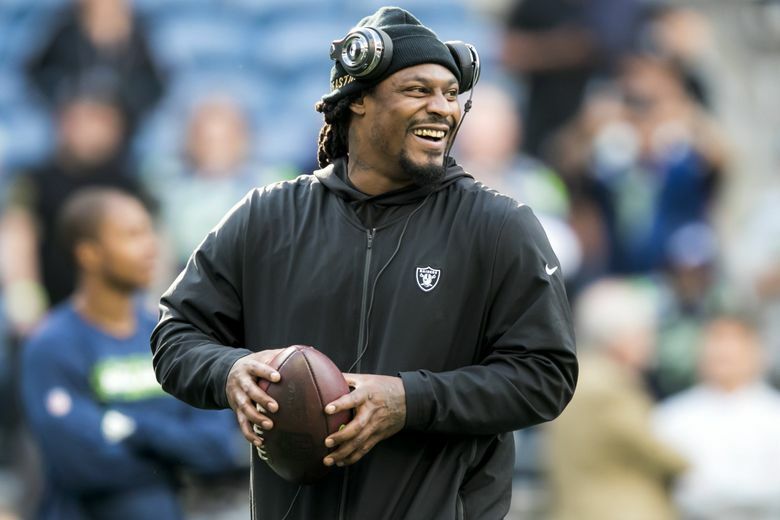 Born on April 22, 1986, in Oakland, California, Marshawn Terrell Lynch was raised by his mother Delisa and he has three older siblings, including Davonte Lynch who also played college football at New Mexico Highlands. He is also one of the four running backs that took part in the San Francisco 49ers’ workout for local draft prospects. Lynch has other relatives who also played the game. They include wide receiver Robert Jordan, quarterback JaMarcus Russell, journeyman quarterback Josh Johnson, and his uncle Lorenzo Lynch, who played in the NFL for eleven years. While studying at the Oakland Technical High School, Lynch participated in the school’s sports activities, particularly in wrestling, track, football, and basketball. In football, he recorded a total of 1,722 rushing yards with 23 touchdowns in eight regular season games. He also made an additional 375 rushing yards with 10 touchdowns in two postseason games and led his school’s team in basketball’s state semifinal. His performance earned him recognition like the SuperPrep, PrepStar All-American, and San Francisco East Bay Player of the Year. While at the University of California, Berkeley, Marshawn Lynch who was at that time nicknamed ‘Money’ participated actively in the California Golden Bears football team. He finished his 2004 season with 71 carries for 628 yards and 8 rushing touchdowns. He also recorded 147 yards on 19 receptions and 2 receiving touchdowns. At the 2005 Las Vegas Bowl, he had 24 carries, 194 yards, and 3 touchdowns. Lynch finished his games in 2006 with a total of 490 carries for 3,230 rushing yards and 29 touchdowns. He also had 68 receptions for 600 receiving yards and 6 touchdowns which fetched him a good number of accolades. Lynch announced his intention to join the National Football League on January 2, 2007, and his dreams became a reality on April 28, 2007, when he was selected by the Buffalo Bills in the 12th overall pick of the first round. He officially became a member of the Bills after signing a six-year $18.935 million contract with the football club. Beginning as a starter at running back, Lynch debuted and gained his very first touchdown plus 90 yards on 19 carries in a 14–15 loss to the Denver Broncos. He finished his rookie season with a total of 7 touchdowns and 1,115 rushing yards. Lynch also received his first recognition as a member of the NFL All-Rookie Team for the 2007 season. That same season, he had his first injury as a professional player. Lynch injured his ankle during the Bills game against the Miami Dolphin. The injury kept the Beast away from three games, only to return on December 9, during the Bills’ second game against the Dolphins. Marshawn Lynch played safe through the 2008 season until on December 21, in a game against the Denver Broncos where he injured his shoulder. The injury kept the young player off the season finale, nevertheless, he was able to make a season record of 1,036 yards rushing and 8 rushing touchdowns. This did not only earn him his very first Pro Bowl, but he also became the first running back from the Bills to head to the Pro Bowl since Travis Henry in 2002. 2009 was quite fair to Lynch injury-wise, this was not so the following year as he suffered an ankle sprain during a preseason game against the Washington Redskins. Shortly after his return, he was traded to the Seattle Seahawks. Lynch suffered no injury all through his career with the Seahawks left for the period he underwent sports hernia surgery in 2015. In 2018, he had a groin injury and was placed on injured reserve on October 22. Marshawn’s career stats as of 2018 boasts of 2,441 rushing attempts for 10,379 rushing yards with 84 rushing touchdowns. He also boasts of 287 receptions for 2,214 yards and 9 receiving touchdowns. Following his two-year $9 million deal with the Oakland Raiders, there is no doubt the football running back earns quite much to take care of his luxuries. The Beast Mode, as he is fondly known, earns about $7 million as salary with his net worth estimated at around $30 million. Marshawn Lynch is not yet married and has therefore not been seen with any woman identified as his wife. However, he has been rumored to have exchanged marital vows with actress Charmaine Glock but there is no proof to it. Lynch was also linked to the famous RnB/soul singer, Netta Brielle. According to reports, Brielle who is also an Oakland California native tied the knot with Lynch but there is no way to substantiate this claim.